Yesterday Giada De Laurentiis was on The Today Show sharing some recipes for comfort foods. One of them was for a Chianti marinated beef stew. Sounded good. I didn’t have the exact ingredients that she used, so I winged it. I used a Cabernet to marinate the meat instead of Chianti. Grant was watching the wine-marinating process. There’s nothing like a little humor to make cooking dinner a bit more fun… My abbreviated version of Giada’s stew turned out pretty well. Heat oil in a heavy stock pot or dutch oven. Sear meat on all sides, making sure it’s really browned. Remove meat from pot and set aside. Add half of the bacon to the pot, cooking until crisp. Add carrots, potatoes, celery and garlic. Pour in the reserved wine marinade and deglaze the bottom of the pot, making sure to scrape up all the browned bits of yumminess and flavor. Add the beef broth, rosemary, sage, white pepper and the can of tomatoes; mix and bring it to a boil. Add the meat back in, cover and reduce heat to a simmer for about 3 hours. Fry up the remaining 1/2 pound of the bacon bits and set aside. Before serving, pull the meat back out of the pot, shred with forks and add back into the stew. 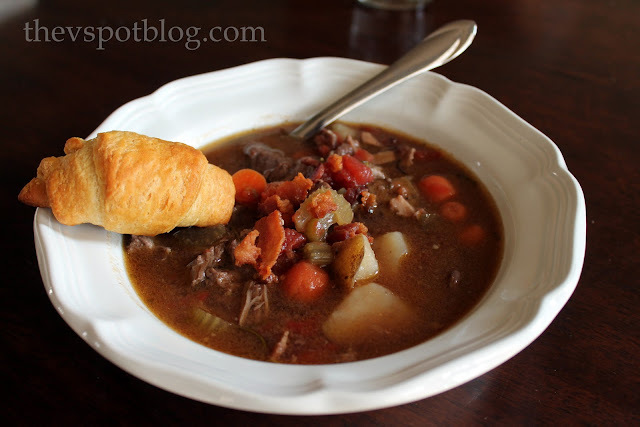 Ladle stew into bowls, sprinkle a bit of the reserved bacon bits on top and serve with a crusty piece of bread or a roll… Those scary refrigerator crescent rolls are always easy. mmmm. A good, simple dinner for a cold night. By the way? Everything tastes better if you eat your meals with a funny kid. This looks so good! So doing this with our crockpot. I saw this too, it looked so yummy. 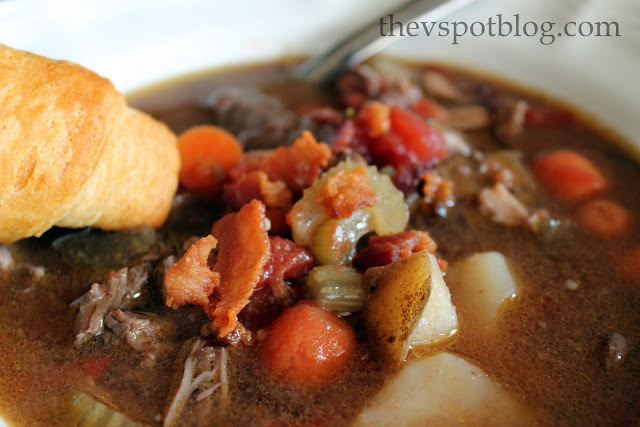 I love a good beef stew in the winter. I think I will skip the sip though! Funny little Grant. So great you are recording these so he will have them when he is old enough to appreciate them! Ha ha ha.. I LOVE what kids say 🙂 Did you use the whole bottle? Did you think it was necessary? I don’t go in liquor stores so I’d have to bribe my sister to do it – lol! I made stew last week…it didn’t look nearly as delicious as yours. I need new healthy, recipes, I am so bored with the same things! Did you say wine? Bookmarking this one for sure! Just a few months ’til we share our first bottle (or 5)! LOVE your little one’s comment! Over the summer we had a similar incident with ours. He made a #2 (which he gets treats for b/c he’s one of those poop horders) and when I asked him what he would like, he said, I think I should have a beer! Too much information but too funny not to share! OMG! too funny! I love making stews with wine! I’ll definitely give this one a try! Funny kids do add a little pizzazz to the table. This dish looks yummy…I can see why you got right up and made it.